My work will be included in Collectibles at Spiro|Grace Art rooms from Friday 2 December until Saturday 17 December. This exhibition features a collection of small scale artefacts which have been produced by creatives from Australia and the Asia Pacific, each responding to individual conceptual concerns to produce affordable collectibles. Local Velocity is the final exhibition in the Pace project, a year-long project curated by Jill Barker. In this exhibition - which is based around the idea of how we can pace our lives - my work will be shown alongside work by Sharon Jewell, Bruce Reynolds, Mike Riddle, Carl Warner and James Watts. The exhibition opens from 5-8pm on Tuesday 1 November at Brisbane Institute of Art and continues until Wednesday 23 November. I'm delighted to be showing some new work at Pine Rivers Art Gallery from Friday 21 October until Friday 4 November 2011. Rise and fall (detail), 2011. I've just heard the exciting news that my artwork Rise and Fall has been selected for The Substation Contemporary Art Prize. Entries will be judged by Alex Baker, Senior Curator of Contemporary Art, NGV and Karen Quinlan, Director, Bendigo Art Gallery. The exhibition opens at The Substation in Newport on Friday 2 September and continues until Sunday 25 September 2011. Works by Rebecca Agnew, Steven Asquith, Kara Baird, Chris Bennie, Liam Benson, Corinna Berndt, Sadie Chandler, Will Coles, Marcel Cousins, Kim Donaldson, Shoufay Derz, Catherine Evans, Emily Ferretti, Sarah Field, Andrew Forsyth, Lisa Frankland, Jennifer Goodman, Robert Hague, Camille Hannah, Katherine Hattam, Pei Pei He, Ash Keating, Jeremy Kibel, Bronek Kozka, Emma Langridge, Christian Lock, Darren McGinn, Kirsten McIver, Tully Moore, Han Nae Kim, Hoang Trang Nguyen, John Neeson, Mike Nicholls, Simon Obarzanek, Norian Paicui, Caroline Phillips, Clare Rae, Steven Rendall, Natalie Ryan, Tracy Sarroff, Rohan Schwartz, Carmel Seymour, Naomi Troski, Elke Varga, Philippe Vranjes, Paul White and Fiona Williams have also been selected for the prize. I'm looking forward to showing new work in my solo exhibition Rise and Fall at LEVEL ARI. The exhibition opens on 1 July from 6-8pm and runs until 22 July. Melinda Ryan Carroll's exhibition Familial Tangles, Louise Sparre's Balance, and Rachael Bartram's Lost Girls - Unchartered Territory and Dream Scapes will also be showing at the gallery. 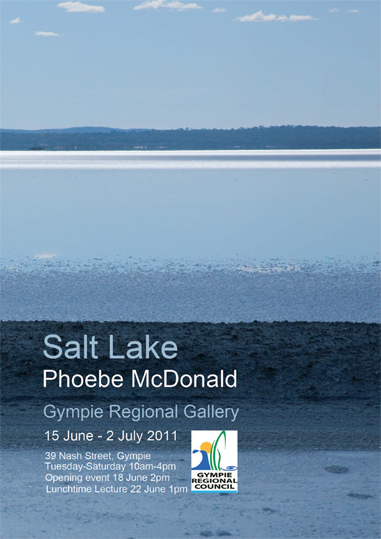 My Salt Lake series is showing at Gympie Regional Gallery from Wednesday 15 June until Saturday 2 July. Dresses, by Anushiya Sundaralingam, and 4 Locals: At My Place, by Kerrie Atkins, Margaret McArdle, Cecile Steenbergen and Violette Vegh-Jameson OAM will also be showing at the gallery. There will be an opening event for these exhibitions from 1-3pm on Saturday 18 June. I am delighted to be involved in Art on James, a unique initiative curated by Louise Martin-Chew and Alison Kubler, which will showcase contemporary art in leading design and retail stores on James Street in New Farm. Art on James will be running from 2-9 June, and is focused on strengthening a dialogue between leading local designers, lifestyle retailers, galleries and artists. Three Brisbane-based artists - including myself - have been invited to create works inspired by James Street designers. Claire Stenning has produced a work in response to Tom Gunn, Simone Eisler has created a work in response to Easton Pearson, and I have made a work in response to FIO Contemporary Jewellery and Design. These works will be available for purchase with proceeds to be donated to children’s charity AEIOU. Featured artists include: John Young, Ben Quilty, Alex Seton, Stefan Dunlop, Craig Waddell, Adam Cullen, Kristin Headlam, Alun-Leach Jones, Ian Smith, Celeste Chandler, Tom Alberts, Fiona Foley, Rebecca Ross, Simone Eisler, Graham Fransella, Michael Cook, Rosslynd Piggott, Lincoln Austin, James and Eleanor Avery, Christopher Langton, Sandra Selig, Natalya Hughes, Tim Johnson, Stephen Hart, Carl Warner, Judith Wright, Alex Chomicz, Grant Stevens, Ian Waldron, Donna Marcus, Joanne Currie, Michael Nelson Jagamara, Ari Athans, Dorothy Napangardi, Laurie Nilsen, Ben Somerville, James McMurtrie, Roberta Easton, Sallie Portnoy, Tali Dalton, Tim Basset Kyss, Kerrie Warren, Bruce Earles, Andrew Kelaher and Helene Cox. A number of exciting Art on James events have been scheduled throughout the week. Head to the James St website for all the details. 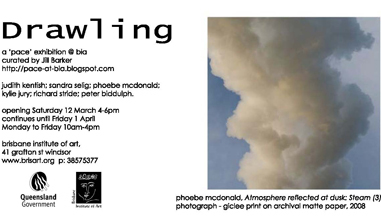 My work will be shown alongside work by Sandra Selig, Judith Kentish, Richard Stride, Peter Biddulph and Kylie Jury in 'Drawling' an exhibition that is part of Pace - a year-long program curated by Jill Barker. 'Drawling' features work by artists whose works could be said to be slow or extended in some way. The opening will be held from 4-6pmonSaturday 12 MarchatBrisbane Institute of Art. The exhibition continues until 1 April 2011. My new body of work The world keeps turning will be showing alongside Rebecca Ross' exhibition Find Your Way at Spiro|Grace Art Rooms from Friday 18 February until Saturday 5 March 2011. The opening is from 6-8pm on Friday 18 February 2011. Entry to the exhibition is free. 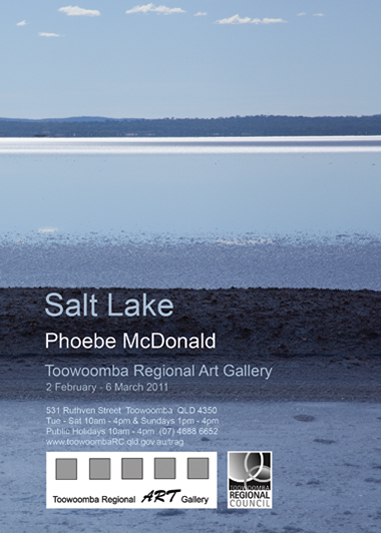 For more information visit Toowoomba Regional Art Gallery. Ryan Renshaw Gallery and Urban Art Projects are presenting Art for Eva on Tuesday December 14, 2010 from 6-9pm at 137 Warry Street, Fortitude Valley. Fifty artists from Australia and New Zealand have contributed artworks for sale for Eva D'Souza, a beautiful 3-year-old who suffers from the rare neurodevelopment disorder, Rett Syndrome. Everyone is welcome to be a part of this special event and purchase some great art for a great cause. Four photographs from my Salt Lake series have been selected for the Future Nurture: Toowoomba Biennial Emerging Artists Award. They will be shown at the Toowoomba Regional Art Gallery from September 9 until October 10. The official opening will be held on Sunday 12 September. My photographs will be shown alongside work by Nathalie Bastier, Amy Cochrane, Jasmin Coleman, Donna Davis, Simone Gillespie, Holy Green Cow, Alicia Lane, Chelsie Luck, Kelly-Marie McEwan, Ann Russell and Tiffany Shafran. I am excited to learn that my artwork 'Shadows II' has been shortlisted as a finalist in the Clayton Utz: LAUNCH Art Award 2010. This work was constructed from metal pins and board. Because its composition relies on shadows cast by the pins, the work is transformed by different lighting conditions. When seen in natural light, the shadows - and composition - evolve over the course of the day depending on the angle and intensity of available sunlight. It will be shown in the Clayton Utz offices at Riparian Plaza until July 2011, alongside work by the other finalists: Anita Hochman, Ari Fuller, Carly Scoufus, Chris Howlett, Dane Beesley, Haruka Sawa, Jan Van Dijk, Jason Fitzgerald, Jim McDowell, Lyndal Hargrave, Meaghan Shelton, Kirra Jamison, Nikola Sweet, Paul Mumme, Nicola Moss, Steven Vella, Sonya Peters, Stefan Dunlop, Sandra Kane, Vivienne Kelly, Rebecca Ross and Simone Eisler. My application for ArtStart funding to establish a business as an artist, and to secure an itinerary to tour work to regional galleries was successful! Seventy other visual artists were successful applicants in the May 2010 round: Abi Alice, Kimberlee Anderson, Catherine Badcock, Andrew Bartlett, Amie Batalibasi, Matt Bromhead, Michaela Bruton, Khara Brugess, Luke Carr, Kate T Deacock, Rebecca Delange, Amanda Dziedzic, Linzie Ellis, Lucy Fahey, Corrigan Fairbairn, Kim Fasher, Raimo Alberto, Dara Gill, Wanda Gillespie, Helen Goninon, Joseph L Griffiths, Noah Grosz, Jessica Hall, Emma Hancock(Aka Emma Anna), Gillian Hand, Cheryl Harrison, Thomas Heidt, Samuel Henning, Jill Hermans, Matthew Hopkins, Adair Imrie, Jin Ah Jo, Anna John, Rachel Joy, Joanna Kambourian, Joane Katsiaris, Erin Keys, Helen Kocis Edwards, Peta Kruger, Emma Lindsay, Liang Xia Luscombe, Nikki Majajas, Lee Mathers, Kristin Mciver, Carolyn Mckenzie-Craig, Erica Molesworth, Claire Nakazawa, Anji Noor, Alex Prado, Carmen Reid, Mark Richards, Leigh Rigozzi, Carly Scoufos, Hoi Ying Shek, Rebecca Smith, Lia Steele, Lisa Stewart, Fleur Summers, Genevieve Swifte, Gabriella Szablewska, Kristina Tsoulis-Reay, Jessica Tyrrell, Chloe Vallance, John Waller, Amber Wallis, Jade Walsh, Katherine Wheeler, Alli Wolf, Vivian Ziherl and Simon Zoric. The 2010 finalists in The Churchie - National Emerging Art Exhibition have been announced and I'm delighted that my sculpture Deep Geometry has been selected. I'm looking forward to showing my work alongside the other finalists: Cheryl Accoom, Zanny Begg, Chris Bennie, Karen Black, Chris Booth, Keith Burt, Georgina Campbell, Trevelyan Clay, Sam Cranstoun, Alex Cuffe, Matthew Dabrowski, Fernando do Campo, Samantha Everton, Christian Flynn, Andrew DK Forsyth, Chantal Fraser, Amanda Gabori, Rachael Haynes, Chris Howlett, Katherine Huang, Kelly Hussey-Smith, Kirra Jamison, Luke Kidd, Catherine Johnston & Lisa Downie, Carly Kotynski, Nat Koyama, Ida Lawrence, Dane Lovett, Matt Malone, Karla Marchesi, Jonathan McBurnie, Brendan McCumstie, Mish Meijers, Jamie O'Connell, Ryan Presley, Angela Rossitto, Ann Russell, Stephen Russell, Carly Scoufos, Bryan Spier, Gabriella Szablewska, Andrew Thorpe, Peter Wilson and Danielle Woolbank. The exhibition of finalists will be shown at the Queensland College of Art Gallery, South Bank from 11 June - 1 August 2010. PHAI-RA! is a survey exhibition of contemporary photo-media art featuring new work by six female artists: Phoebe McDonald, Heidi Stevens, Anna Jacobson, Imogen MacDonald, Rebecca Smith and Ashleigh Kennedy. The exhibition opens on Thursday 25 March from 5-9.30pm and continues until Tuesday 6 April at Bleeding Heart Gallery. 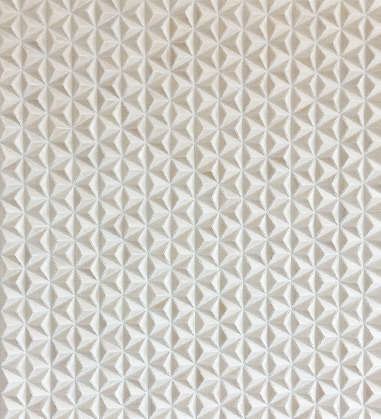 I have been invited to participate in 'Test Pattern 2010', an exhibition of recent Queensland graduates at Ryan Renshaw Gallery. Also exhibiting are: Sue Beyer, Anna Carey, Alex Cuffe, Nat Koyama and Stephen Russell. The show runs from February 10 - 20. Opening night is FridayFebruary 12 from 6-8pm.